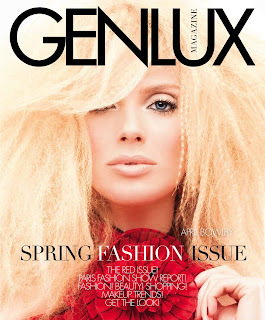 My Genlux interview with actress April Bowlby is on the newsstands now. In case you don't know who she is, she's currently starring with Margaret Cho in Lifetime's Drop Dead Diva. But maybe you'll recognize her as Jon Cryer's girlfriend/wife on Two and a Half Men and Neil Patrick Harris' girlfriend on How I Met Your Mother. If you met her you'd want her to be your girlfriend, too. This was one of my favorite interviews I've done. She was sweet, funny and genuinely nice and what started out as a 45-minute lunch turned into an almost three-hour afternoon. After it was done I wanted to be best friends with April and invite her over so we could talk about boys and give each other fake tattoos with Sharpies. That didn't happen but we did become friends on Facebook, the adult equivalent of someday possibly maybe planning to hang out at Dairy Queen after school. You can read the interview and see all the photos here. When we first arrived in the bleacher area they were handing out small boxes of Krispy Kreme donuts which was exciting because, holy crap FREE DONUTS. But here's the surprising, weird, unnatural thing: I didn't even eat mine. 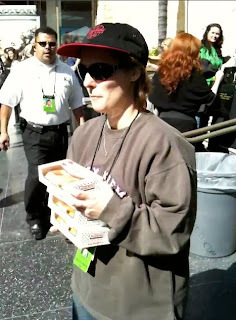 In fact, I have no idea what happened to them because somewhere in the excitement of being at the freaking Academy Awards and trying to juggle my iPhone, my video camera and my digital camera I lost a box of donuts. As I'm sitting here typing this I'm actually really, really missing those donuts. But who can cry over sugary blobs of dough when there's George Clooney within zoom lens distance? George is officially my new favorite celebrity. He was the only one who broke from the press line and came all the way over to the bleachers to say hello. In fact, message to Bradley Cooper, who I didn't see on the Red Carpet and certainly didn't come over to greet the fans -- YOU HAVE BEEN REPLACED. Here's Matt Damon. Unfortunately when I saw him through my zoom lens I shouted out, "It's Leonardo DiCaprio!" I may not be invited back next year. Here's Meryl Streep looking fantastic as always. 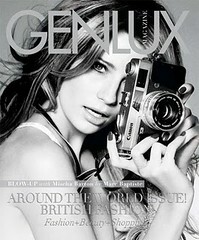 I think I saw the most camera flashes going off when she stepped onto the Red Carpet. Meryl looks so happy and relaxed, because I don't think she was concerned with winning the Oscar since she's won around fifty times before. Also, directly behind her is George Clooney, and who wouldn't be happy with George Clooney behind them? That didn't come out right. That's Ryan Reynolds. Otherwise known as My Niece's Future Husband. Mo'nique was workin' the camera. Sorry to disappoint, but I wasn't able to zoom in on her hairy legs. Besides, I hear she shaved them. For some reason that makes me sad. This is a bad shot of James Cameron and his wife Suzi Amis. Somebody should give her some of those donuts. Call me old school but I was pretty excited to see Quincy Jones. Here's E!s Giuliana Rancic. I was supposed to interview her a couple of weeks ago at an Oscar suite event at a hotel in Hollywood, but when I got there they said she had gotten sick and canceled. But hey, I got a free manicure and got to sit around drinking scotch with some famous people I didn't recognize so I forgave Giuliana pretty quickly. At the end of the Red Carpet arrivals we all were escorted across the street to the El Capitan theater where we watched the awards on the big screen while we ate dinner. Rigel was able to meet me there for this event, although we were in a mild state of panic when we discovered they weren't serving any drinks. Not to sound desperate or anything, but after a long day I was looking to unwind with a nice glass of wine. But luckily they had an all-you-can eat dinner buffet which made me pretty ecstatic. This photo of Mo'nique accepting her Best Supporting Actress Oscar was taken while I was balancing a plate of mini quiche, some eggrols, a Caesar salad and a tub of popcorn on my lap. I agree -- I deserve an award for that. This is just the first of my posts on going to the Academy Awards. Yes, there will be many, because how could I fit the events of that amazing day into just one post? If you know me, it takes at least 1500 words to tell you about picking out a frozen pizza at the supermarket. Oh, make that 2500 if I give you the details on how I took ten minutes giving the cashier exact change. I have to say the preparation for going to the Oscars was the most stressful part. First of all, what was I going to wear? I had commentors on my blog daring me to wear my bathrobe and one person on Twitter suggesting that I wear a flowerpot on my head, so you can see the level of sophistication people expect from me. Add to that the fact that putting on pants constitutes a dress-up day around here and you see what I was up against. Luckily I had some help getting myself Red Carpet-worthy and all I had to do was put on pants. But that was only half the battle. What about my mug? How was I going to go from mom blogger to someone who was Oscar-bleacher-worthy? After all, if Bradley Cooper happened to glance over my way I wanted to make sure I looked my best and I hear unibrows don't go over too big with foxy movie stars. So to the rescue came my friend, Marygene, who showed up at my house at 6:45am on Sunday morning to do my makeup. She came over to help me and my fellow blogger Donna get ready for our close ups. Notice the huge stash of makeup she brought with her -- obviously word of my large pores and undereye circles preceded me. And to top it off, Marygene lives in Hollywood and was nice enough to offer to drop us off close to the Kodak Theater so we didn't have to take a cab like we had planned. I have to admit I was a little nervous about taking one, since I'm from L.A. and don't even know how to take a taxi; Do you ask them up front about the price? Do you chat with the driver? Does the car have seatbelts? Can you tell them how to drive like you do when your husband is at the wheel? We had to show our official papers from the Academy to get through the police barricade, and then it was on to a checkpoint to get our badges and gain admittance to the bleacher area. I have to say that everyone was extremely friendly and there was none of the attitude or airs that you would expect from such a high-profile event. I think I had more problems with the staff at our middle-school theater night -- I'm telling you, give a 12-year-old some power and they turn into Mussolini. Yes, that's right - Jason Bateman is looking right at me! I think he was saying something like, "Check out the amazing blogger in row 4." 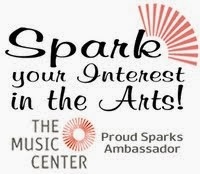 Disclaimer Small Print! I was invited by Kodak to be their guest in the bleacher seats at the 82nd Annual Academy Awards. The bleacher tickets have no monetary value and I was not paid for my attendance or compensated for writing this post. Vendor(s) mentioned in this post have no affiliation with Kodak. I do not actually think my kids' middle-school classmates are like Mussolini, more like really bossy midgets.